We start an incredibly busy few weeks for us at the Orchid Project with Cattleya intermedia. This Friday we head for to the Bournemouth Orchid show for what promises to be a fabulous weekend, and the the RHSLondon Orchid Show is just over two weeks away. 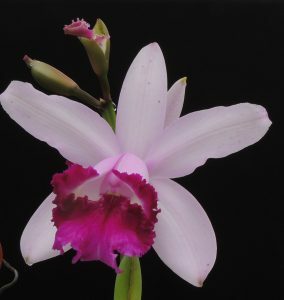 Cattleya intermedia is a highly variable species from Brazilian coastal forests and scrub, up to about 1000m in the coastal mountains. 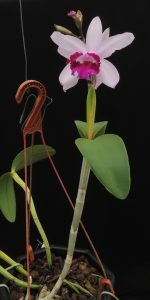 The plant photographed here is one of the ‘orlata’ variation which has a larger shorter lip than the standard form and is a really spectacular orchid. The species is bifoliate (two leaves on each pseudobulb) and the leaves of this species often have a slightly serrated edge. Flowers are variable in shape and colour (there will be more varieties over the next month or so) as well as being variable in the size of plants. All varieties seem to appreciate growing in a basket with free drainage for the thick roots that soon wrap around the basket in all directions. The species also appreciates lots of sun which is not a surprise as the natural habitat is very exposed. Plants are warm to intermediate growing and seems to love our Warm Americas Section (Minimum 15C) where they hang in the roof. 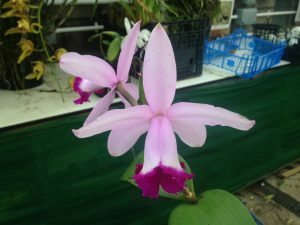 Why not start your own collection of Cattleya intermedia and see how much variation you can find.